Review: How To Start A Lawn Care Business A Whole New Way! 28 year lawn care / landscape veteran Ken LaVoie is the creator of this package, which includes the 164 page eBook / Kindle Book "How to start a lawn care business a whole NEW way" plus a ton of resources that can save you a hours of research, trial and error, and document creation. If I could offer one tidbit to encourage you to purchase Ken's program, it would this: Since launching his book and program about 10 years ago, he's only received two requests for refunds in all that time. That says something. 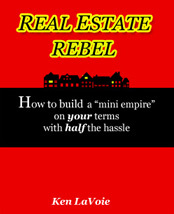 This book covers everything; from equipment to insurance, to client psychology. The parts on psychology may be the most important of all. Lawn care is hard work, and it can be discouraging at times. There's employee problems, impatient clients, staying organized, equipment breakdowns, and especially weather. Ken is also pretty ruthless when it comes to equipment recommendations. He's not afraid to "dis" a brand name if he thinks it's junk and he's almost a fanatical fan when he finds something he likes. (He would run nothing but early 1990's Shindaiwa T-21's if he could! And his least loved brand? Surprisingly, it's Echo. Ken goes into great length on specific techniques on all the basics, like leaf cleanup (with separate sections on spring and fall cleanup), mowing, trimming, mulching, hedge trimming, etc. Other well-covered topics include managing the office, with emphasis on Quickbooks and various methods of tracking time, materials and finances. Retirement planning, health insurance and benefits, and more. And of course there's a section on marketing, including the under-rated value of simple word-of-mouth and how to leverage it. Although every guide listed here is worth at least ten times the asking price, we'd put How To Start A Lawn Care Company A Whole New Way! at the top of the list. But trust us when we advise you to buy all 3. Email support and consultation for one year. This alone might be worth the price of the package, which is $37.00 and you can get a 20% discount by just sharing it on Facebook! 12 Letters to send to clients to inform them of price increases, "welcome back" spring reminder letters, etc. If you are serious about starting a lawn care business then chances are that you have looked at purchasing one of the many lawn care business startup guides that are available online. The lawn care industry has a number of experts who are willing to share the secrets, tips and tricks that they have learnt from running successful lawn mowing businesses for many years. Since starting this site in 2008 I have personally reviewed many of the guides and startup kits that are being sold on the Internet. While most contain information that will be of value to you, there are a few that are an absolute waste of your money and time. Some are a mixed bag with some good stuff padded out with a lot of fluff and general business advice that you can get elsewhere. Rather than reviewing multiple products and having to write negative things about some of them I have decided to only focus on the positive. They have their strengths and weaknesses like any product. I've reserved this page for a review of the guides that we think are absolutely the best that are currently available anywhere. Ken LaVoie adds: Although this review, originally written by Steve, talks mostly about Lawn Company Secrets, I've added links to one more program at the end of this article that I think is worthwhile. The "Grass to Cash" system. What I've discovered, both through creating my own program and reviewing others, is that each program has strong and weak points. You may love ideas 1,3 and 5 in program one, and ideas 2,4 and 6 in another. Most of these lawn care business guides are very inexpensive ($25-$100) and I'd advise going through as many of them as you have time to digest. At around $37 each (the most common price) you can get 3 programs for around $100. That's an HOUR with a typical business consultant, or the price of a tank of gas or two! And these programs were created by honest, hard-working lawn care business owners who want to see you succeed. Ken has even been known to answer follow up questions by email. Anyone that has bought his package knows that he contacts them personally by email, thanking them and asking for feedback. Additionally, he offers a six month money back guarantee. He only asks for thorough feedback so he can make the program better. Since he launched his program about ten years ago, he's only had 2 requests for refunds out of several hundred programs sold. 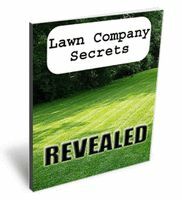 I feel that Lawn Company Secrets is definitely the best package overall for both newcomers and those who already have established businesses. My review of this product is as follows. Lawn Company Secrets has been put together by Wayne Mullins, a retired lawn care business owner who now helps others to succeed. His story is quite inspirational so make sure that you read through his home page completely to find out what is possible in this industry if you put your mind to it. You can read his story here. Mullins offers not just one guide but a set of six; each relating to a different aspect of starting a lawn care business. These guides are quite comprehensive in that they offer beginners all the startup information that they need to get set up and running. Licensing, equipment, estimating and scheduling are among the many topics that are covered in detail. What really sets this series apart from all the others is the attention that the author gives to marketing, which is essentially one of the most important success factors for any business. After getting tired of reading startup guides with advice like 'take out an ad in The Yellow Pages' it is very refreshing to get hold of some marketing resources that REALLY can make a difference. The Lawn Company Secrets series dedicates three of its five guides to marketing and it is easy to see how some of the advice and resources provided could result in a steady stream of new business. Mullins doesn't just tell you how to do your marketing; he practically does it for you. Included with this package are a series of letters that have proven to bring in loads of referrals and convert prospects into new accounts. Take advantage of these professionally written letters by simply inserting your company name and the date and you are good to go. Mullins tells you how to run a lawn care business by implementing systems that streamline every aspect of your day to day operations. He has developed what he calls the 'Central Nervous System' which allows you to create a business that can run smoothly even when you are not present. The kit currently comes with a bonus guide that includes templates for lawn care business flyers and postcards. Additional letters and contracts that can increase your chances of winning both residential and commercial accounts are also included. This makes for an excellent collection of six 'easy to read' guides. 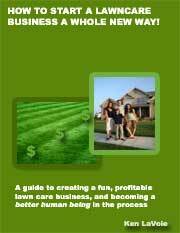 This package offers you all of the information that you need to get started the right way and set yourself on the path to making a six figure income .The author definitely has some unique insights into the lawn care business and he shares all with his readers. I would even go as far as to say that this guide will change your outlook for the better. It will allow you to skip the learning curve that holds so many back and let you fast track your way to the mind set of an experienced lawn business owner. Visit Lawn Company Secrets web site to learn more about Lawn Company Secrets and find out what it can do for you if you want to start a lawn care service. Another great lawn care business guide is the "Grass to Cash" system, created by Kevin Whitesite. Visit the Grass to Cash web site to learn about his useful lawn care startup program. And of course, how could I fail to mention my own "How To Start a Lawn Care Business a Whole New Way"? I've personally logged twenty-six years as a lawn care business owner in Central Maine and I believe I have a useful thing or two to tell you about the lawn care and landscaping business. My entire program is $37 which includes a copy of my book, and downloads of all my business spreadsheets letters—even a quickbooks company file template if you use quickbooks. Disclosure - We are compensated for our reviews. Click here for details.